Annual parasitic vine over 50 cm long Stem: pale orange or pinkish yellow, climbing on other plants and attaching to them with specialized outgrowths (haustoria) which invade tissue of the host plant to absorb food. Leaves: alternate, orange or pinkish yellow, very small, scale-like. Flowers: many, stalkless, white to greenish white, tiny, 1.5 - 3 mm tall, radially symmetric, somewhat urn-shaped (about as tall as wide), with five, flaring or reflexed, pointed petal lobes. The flowers are arranged in very short-stalked, small, compact clusters scattered fairly closely along the stem. Sepals: five, but fused at base, then separating into five, broadly egg-shaped, often wider than long (though about as long as the petal tube), very rounded-tipped lobes often with overlapping bases which form five small wing-like angles. Petals: five, but fused for about half their length, then separating into five, flaring or reflexed, 1 mm long, narrowly triangular lobes with long-pointed tips of which the very ends often turn upwards or slightly inwards. Stamens: five, attached to inside top of petal tube alternating the petal lobes, with short filaments, but the anthers visible and extending just beyond reflexed petal lobes. Pistil: with one, two-chambered, superior ovary; and two, 0.5 - 1 mm long styles which end in rounded stigmas. Fruit: small, somewhat rounded, two-seeded, membranous capsules. The withered petal tube remains attached as a cup to the base of the fruit. 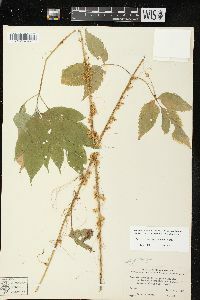 Similar species: Cuscuta pentagona is probably most like C. indecora var. 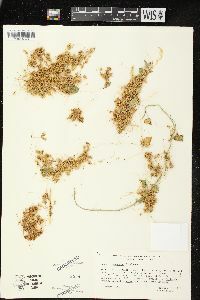 neuropetala, except that taxon has much larger and more loose flower clusters, the flowers are obviously stalked, the sepal lobes are more pointed, the petal tube is much longer than the petal lobes, and the fruit is totally covered by the withered petal tube. Also similar is C. gronovii, but that species has much tighter and confluent flower clusters with many more flowers, the sepals are obviously shorter than the petal tubes, and the petal lobes have rounded tips. 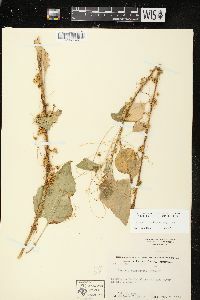 The other species of Cuscuta in the Chicago Region differ in several possible ways including having bracts below each flower, non-fused sepals, or only having four sepals and petals rather than five. Habitat and ecology: Occasional, in a variety of habitats from prairies, sandy flats, and even disturbed soils. Notes: We are treating this species in the widest sense and including within it the entity sometimes separated as Cuscuta campestris. Some authors separate the two species based on C. campestris not forming the five little angles between the sepal lobe bases. Etymology: Cuscuta is an ancient Latin name for dodder, probably of Arabic origin. Pentagona means five angles, in reference to the five angles created by the overlapping bases of the sepal lobes. This is our common field dodder and must be regarded as an obnoxious weed. It is commonly found on clover Hosts of my specimens are as follows: 1 on Daucus carota, 3 on Euphorbia corollata, 1 on Lespedeza, 1 on Lespedeza striata, 8 on Trifolium pratense.